Just graduated and heading to Tolar, Texas to Von Drogo Kennels. Pipeline leak detection dog graduate. Our first ever German SHORTHAIRED Pointer headed to a student in North Carolina. Cooper locating his leak by digging for that buried natural gas and oil pipeline. Heading to North Carolina with Cooper. Teaming up to detect leaks in buried natural gas and oil pipelines. Another leak find by a graduate of K-9 Pipeline Training Academy! Pipe Dogs Inc. dogs just found a leak in 3.5 mile of 10 inch new construction near Midland Texas. Once our scent injection was complete, it took the dog less then 10 minutes to locate and pinpoint the leak. January-2019. Chris Kyles graduates with his Pipeline Leak Detection Dog, Bailey. May-2018. Nathan Whittley out of Texas graduates with his Pipeline Leak Detection Dog Gorgon, a male Belgian Malinois. May- 2018. Cecil Jones from Gold Knights K9 Detection out of Houston Texas graduates with pipeline leak detection dog Sobo a female Belgian Malinois. April-2018. Scott Simons, Stuart Musslewhite and John Reinivinch out of Texas graduate with three Pipeline Leak Detection Dogs. April-2018. Steve Magill our first student from overseas (United Kingdom) graduates with one pipeline leak detection dog. Steve will now be providing services not only in the United Kingdom but throughout Europe and the Middle East. April-2018. Alpha Dog Pipeline Leak Detectors performs successful leak find with their dogs in a New York City, apartment building. First time our dogs detected a leak inside an existing building behind a concrete wall! March-2018. Pipe Leak Pups and OK K9 Leak Detection on the job together in Texas with four pipeline leak detection dogs. March-2018. Direct Integrity completes 300 miles of pipeline inspection with their 6 pipeline leak detection dogs. February-2018. Will Keaton from Alpha Dog Pipeline Leak Detection out of Indiana graduates with two pipeline leak detection dogs. Wolfe and Sara, two Belgian Malinois. January-2018. Chevon Jones from Gold Knights K9 Detection Services out of Texas graduates with pipeline leak detection dog Zane a German Shepherd. December-2017. Mich Hager from K-9 Pipe Inspection out of Idaho graduates with two pipeline leak detection dogs. Bjorn and Yara, two Dutch Shepherds. October-2017. Pipe Leak Pups locates two leaks in Texas with dogs Recon and Riot. October-2017. Billy Cheek from B&K Dog Leak Detection out of Louisiana graduates from K9PTA 101 with two pipeline leak detection dogs Amber and Kobe. September-2017. Pipe Dogs on the job with their dogs Holly and Hondo in New Mexico. August-2017. Pipe Leak Pups locates leaks in Louisiana with their pipeline leak detection dog Recon! Also called in Ok K-9 Leak Detection to assist on the job. Teamwork! August-2017. Pipe Dogs completes successful pipeline leak detection jobs in Washington and Oregon with their pipeline leak detection dogs, Holly and Hondo. July-2017. 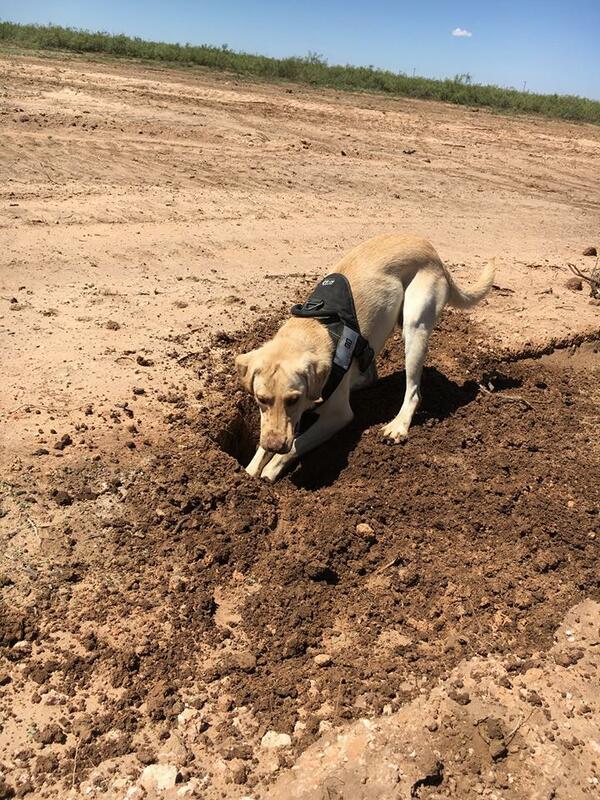 Pipe Leak Pups, locates leaks in South Texas with their pipeline leak detection dog Recon. Also called in Ok K-9 Leak Detection, Ciarra, McKean and their pipeline leak detection dog Kylo. Two graduates on one job! May 2017: Nikki Tackett from Pipe Leak Pups out of Texas graduates from K9PTA 101 with pipeline leak detection dog Recon a 12 month old Belgian Malinois. March 2017: Ciarra McKean from OK (Oklahoma) K-9 Leak Detection graduates from K9PTA 101 and takes home her pipeline leak detection dog Kylo, a one year old black Lab. February 27- March 2, 2017: Two Graduates from K9PTA are attending the 2017 PPIM (Pipeline Pigging & Integrity Management) Conference in Houston, Texas. Direct integrity Services with their pipeline leak detection dog Shama and Pipe Dogs out of Montana. February 20- 25, 2017. CDIS, K-9 Pipeline Leak Inspection attends K9PTA 101 and graduates three new students and takes home pipeline leak detection dog Mr. Bates, a one year old black Lab. February-2017: Pipe Dogs locates leak in Midland, Texas with their dogs Hondo and Holly. January-2017: Direct Integrity Services completes K9PTA 101 and is now providing leak detection with K-9 Shama. January-2017: K9PTA was a guest speaker at the 27th annual No Spills Conference in Traverse City, Michigan. Sept- 2016: Pipe Dogs performs successful leak find in Texas. July-2016: Pipe Dogs completes 140 miles of pipeline leak detection in South Dakota. July 2016: Von Drogo Kennels completes K9PTA 101 and is providing services in the state of Texas with K-9's Avery and Rebel. July 2016: Sara O'Connor- Completes K9PTA 101 and is providing services with two dogs. Cooper our first ever German Shorthaired Pointer, trained pipeline leak detection dog and Duchess, a black Lab in North Carolina. June 2016:- Stefan Wohl, Pipeline Safety Inspector completes K9PTA 102. March 2016: Pipe Dogs completes successful natural gas leak find in California. March 2016: K-9 Pipeline Training Academy attends Police K-9 Conference and Vendor Show in Las Vegas, Nevada. October 2015: KBK9 completes K9PTA 101 and is providing services with two pipeline leak detection dogs, Gabby and George in the state of Arizona. August 2015: K-9 Pipeline Training Academy attends HITS K-9 Conference and vendor show in Jacksonville, Florida. January 2015: Pipe Dogs completes K9PTA 101 and is providing services in the state of Montana with two pipeline leak detection dogs, Holly and Hondo. November 2014: Melissa Stormer from Maitland K9 attends and graduates from K-9 Pipeline Training Academy LLC where she learns how to perform K-9 Pipeline Leak detection. August 13-17, 2018: HITS Handler Instructor & Training Seminar, Washington D.C.